An interesting thought experiment: How would you value your wine collection should the labels wash away? Yesterday I’ve had the pleasure of visiting a local boutique winery. The winemaker took us on a short tour through his winery explaining about the high quality of the local terroir, a French term used to denote the special characteristics the vineyard’s geography has and its affect on the quality of wine produced. We then followed to the barrel storage room where he proudly displayed his French oak barrels bought at $1,000 a barrel to give the wine that special flavor, we continued on to bottling and learned that the wine apparently goes into shock after being bottled for the first time which actually causes it to close up and lock in flavors and aroma. The tour ended with a series of tastings, in the shop of course. They were pretty good wines, if at all possible to judge by my standards (me being wine ignorant). If you’ve noted a sarcastic tone, you’re right. I’ve always felt antagonism towards the wine industry and its elegant way of marketing to the so-called elite. Many products have branded themselves as gourmet and luxury. This is a sought our niche for any product as the net profit is simply mind boggling. There’s no better way to market something as sophisticated and gourmet as complicating it so much it takes whole courses to learn to differentiate between wines. The fine palette and nose required to tell if a wine is truly good remind me of the H. C. Andersen’s the Emperor’s new suit where only the wise can see the emperor’s fine clothes. I have no idea if it’s true or not but I heard the weird scoring system in tennis was invented in order to prevent the poor from keeping up with the game. Even more interesting, I once heard the French language had so many vowels inserted into words in order to keep the poor from learning to write. These maybe funny notions but the truth they hold is real enough. The French are fanatic about their wine traditions. Region, maker, grape and everything else are strictly monitored and old customs are preserved and followed to the latter. The French were understandably upset when Australian and Californian wine makers began producing wine differently. They had wine age in huge tanks with chunks of barrels thrown in for the flavor, no less! Such a disgrace was unheard of. Needless to say Australian and Californian wines are considered among the best in the world and keep winning blind tasting tests. The taste of wine, in my opinion, is tremendously affected by our psychology. Imagine the through experiment suggested in my introduction which comes from a play I heard about recently. 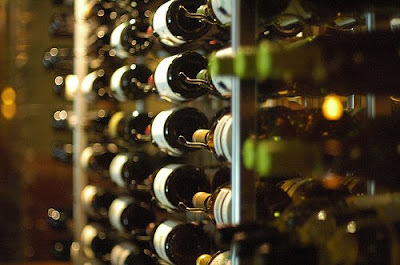 Imagine you had a wine cellar full of prized wines slowly aging and improving to perfection. When you have friends over you walk down together, choose a bottle, and drink it with a nice dinner. Like a proud parent you present your wine collection telling the story of each and every bottle. Now imagine a flood in your cellar removing all the labels from your bottles yet leaving the wine intact. Isn’t that just horrible? Much of the wine drinking experience comes from the bottle’s shape, the label’s elegance and prestige and your knowledge of the wine. That’s simply how the human mind works. That is also why we’re willing to pay so much for wine. The thought of me buying something at x100 the cost of producing it simply irritates me. Thankfully there are great wine critics out there which see through the marketing ruse and agree that 90% of great wines can be purchased for under $30.